This match was one of the most impressive performances put on by Arsenal in a very long time. The pressing movements of the Gunners were set up perfectly for Liverpool’s system in the first half. Couple the pressing with a more efficient positional structure for combinations – and you get a halftime scoreline of Arsenal – Liverpool 3:0! Arsenal dominated the rhythm of the match in the first half, and it was through a quality you see missing in a lot of EPL teams – efficient pressing. To be fair, their pressing was only successful during the first half when Liverpool played with a back 3 – Arsenal wasn’t able to adjust correctly when Liverpool switched to a 4-1-4-1 formation when Daniel Sturridge came on. Arsenal’s pressing out of their defensive shape was compact in all directions (for the most part – this is the EPL after all! ), and well coordinated in order to shut down nearly all of Liverpool’s options when on the ball. This lead to multiple losses of the ball by Toure and Sakho in the defense, while Can is more talented on the ball and dealt with the pressure slightly better. It was Coquelin, Monreal, Koscielny, and Mertesacker who took on the role of covering the defensive movements of the team high up the field. The image above highlights how Arsenal pressed Liverpool in the match. The yellow arrows show the ball-oriented covering movements of Arsenal’s defenders when the team was pressing high. Notice that Sterling, Coutinho, and Markovic were all quite high and disconnected from the ball – this is due to Liverpool’s usual approach to their offense. Liverpool like to use their back 3 for stability in buildup play as they outnumber most forward lines – meaning they always have 1 extra defender than the opponent is pressing with. The ‘free man’ from defense advances with the ball while the central midfielders of Liverpool look for supportive movements, but their main focus is to open passing lanes directly into their talented front 3 of dribblers. In the EPL there is a lot of man-marking (especially in midfield), so what Allen or Lucas do in possession is make evasive movements from the passing lanes between the half-backs and the forwards. So Liverpool’s wide forwards focus mainly on occupying the halfspaces as they are moving inside from the flank while the central striker makes evasive runs from the center and also helps in combination play once the ball is received between the opponent lines. Liverpool’s focus on long, low, vertical passes from defense and into the forwards is what caused them trouble here. As you can tell from the image, Arsenal wasnt fully man-marking. They were making ball-oriented shifts in the defense and congested the area near the ball. Notice in the orange zone that Ozil doesnt mark his player, but he makes sure to block the passing lane into the player with his cover shadow before shifting closer towards the ball. Along with that, Cazorla and Bellerin (two talented and dynamic players) step up immediately to cover any possible short combinations. Meaning as long as there is pressure on the ball-player so he cant pass freely, the Liverpool central midfielders cannot expose the lack of a direct marker with small movements – because they will just be in another players zone. This also meant that the usual long passes out of defense didnt have a clear passing lane to move through – which mostly results in inaccurate long balls won by Arsenal’s covering defenders or losses of the ball right infront of goal. In the yellow zone you will see Giroud doing what he did for nearly the entire first half – covering Toure before pressing the half-back. This means Sakho cannot play backwards and that his options for a pass are cut down significantly. On top of that, Ramsey is blocking the passing lane into Moreno so Sakho has no real option while Ramsey sprints towards him to double-team him with Giroud. The most probable controlled escape in the situation could have been to bounce the ball off of Allen into Toure, but Cazorla and Ozil were in the area ready to press him immediately – and Ramsey’s pressing run was slightly looped in order to make the vertical passing lane more difficult to play through. Lastly, the green zone. The green area was used for balancing as Monreal and Sanchez blocked any possible long passes towards the far-side. This was usually their role in defense because Arsenal forced the ball into Sakho more often than Can (and with good reason). These movements from Arsenal were particularly impressive as its rarely seen that teams are competent enough in their pressing to remain diagonally compact. Notice how Sakho is the closest player to his own corner flag? That is nearly the longest possible amount of space a pressing team would have to cover while remaining compact. Arsenal were able to structure their movement in such a way that they pressed the ball in a diagonal fashion – how much of it was actually planned? Who knows. So what happened here? Sakho lost the ball when Ramsey tackled him, the ball went straight into Giroud with Ozil and Sanchez making runs into the box unmarked – but Giroud was offside when he received the ball! Nearly a perfect pressing scene. 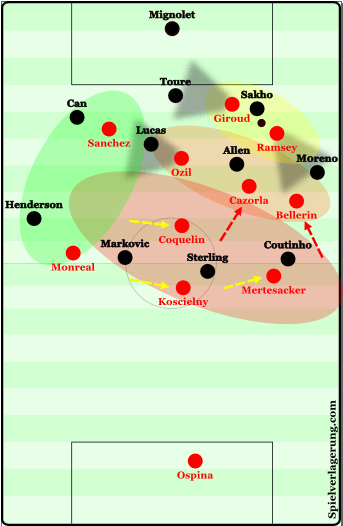 A large part of what lead to Arsenal’s dominance of the game’s rhythm was their positioning while in possession. Monreal and Bellerin were both high up the field – while Bellerin was much more involved in combinations and dribbling scenes. Cazrola moved up the field next to Ozil while Coquelin played in front of the defense. Cazorla and Ozil had supportive roles in the creation of combination play while Sanchez (who made more penetrating runs) and Giroud positioned themselves between the lines – and Ramsey was positioned in between the lines much more often than he dropped deep. Liverpool defended in what was a 5-4-1/5-2-3 shape and Arsenal had an easy time controlling the center during possession. Coquelin would play safer passes (with the rare penetrating through pass sprinkled in) from deeper areas while Cazorla and Ozil joined him very frequently – having no problems against Lucas and Allen. Arsenals players found many opportunities for vertical passes into Sanchez, Giroud, or Ramsey for combination play. Bellerin made diagonal inside runs quite frequently and added a more direct rhythm to the creation phases. The adventurous positional structure lead to good counterpressing. When the ball was lost Arsenal was able to immediately pressure the ball with many players and win the ball back. Coquelin had an impressive showing in regards to his pressing ability during transition in the game. Bellerin, Monreal, Cazorla, Giroud, Sanchez, Ramsey, and Coquelin are very good players to have pressing for you high up the field – and this is why Wenger’s men were able to dominate the rhythm so well in the first half. The first goal came when the ball was switched out to Ramsey and Liverpool weren’t compact enough to support the situation correctly (as I’m sure you’re used to by now) and Bellerin made a very quick diagonal run into the box while receiving a lay-off from Ramsey. Bellerin feinted his movement to beat Moreno and then took a touch inside before curling it into the left corner. The second goal came from an Ozil free-kick which was created by Ozil receiving a quick, low, diagonal pass in between the lines. The third goal came in transition from a great vertical pass between Liverpool’s lines into Ramsey – who played a ball across the front of the box to Sanchez before Sanchez cut inside and scored from range. These were all a result of an impressive Arsenal strategy. In the second half Liverpool were much more stable in possession. This is because Daniel Sturridge came on and Liverpool switched to a 4-1-4-1 with Sterling and Coutinho as wingers, and Lucas, Henderson, and Allen as central midfielders. Resulting in Arsenal having a tougher time in possession because of a much improved defensive structure from Liverpool that had a higher central midfield presence and 2 players on each flank at the same time. Arsenal’s pressing wasn’t as successful either because of the change in positional structure of Liverpool’s wide build-up play. When Liverpool attempted the build-up through the wide/halfspace areas the fullbacks would be wide and high, the winger would drop into the halfspace for a vertical option, the near-side central midfielder supported the ball from inside, as well as Sturridge moving much more ball-oriented in possession and offering yet another pass option. This was a much more stable approach and demanded a different pressing scheme from Arsenal – which they didn’t seem to have ready. The Gunners eventually substituted Flamini on for Ramsey and Welbeck on for Ozil, and began defending in a deep 4-4-2 shape – with all the usual problems we have mentioned before from EPL defenses. Liverpool didn’t take full advantage of Arsenal’s unstable deep defense in the second half, scoring only 1 time from a penalty. Arsenal managed to score in transition at the very end of the game, resulting in a 1-1 second half scoreline. A great first half and a lackluster second half from Arsenal. The game’s scoreline could’ve been even crazier if Arsenal were able to adapt their pressing scheme to Liverpool’s second half structure, but it didn’t seem Wenger wanted to be as active or look for a solution in the pressing with a 3:0 lead in the second half. Arsenal now take 2nd place and look like the “title contenders” Mourinho described them as, though it seems the season is too close to being finished for any real threat to Chelsea’s title run. AO, send this to Gary (Gary right?) Neville. Maybe he understands that defending is more than defenders handling crosses. Diagonal compact, great! It seems like Arsenal loves to play against teams with a Back 3/5. First Liverpool game last year, Gala in the CL and United in the FA Cup have all played with a back3 against Arsenal and in all of those matches Arsenal has been dominant.